New Winter 2018: Look closely to see the lovely and delicate design of a tree on the gown of this heavenly being. Trees symbolize wisdom, strength and energy. The angel is praying under a trellis, perhaps that those qualities might be imparted to the recipient. 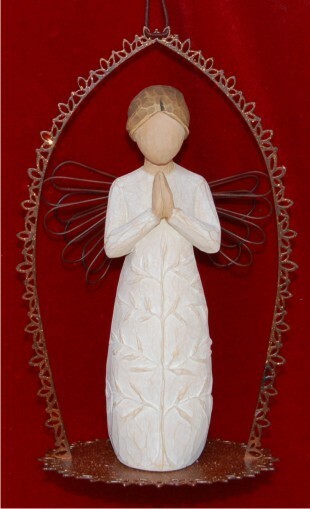 The tree, a prayer trellis angel ornament is one of a series of angel ornaments from artist Susan Lordi. This one makes a lovely gift idea for anyone needing wisdom and guidance for the challenges life has placed before them. It can be a comforting reminder for your home and a blessing to friends too. We are told that those who seek will find, and the praying angel trellis ornament is a comforting reminder of that to all. For a dear friend Dec 22, 2014 Judy W.